The joint journey of director Spike Jonze and screenwriter Charlie Kaufman into orchids, the human mind and Darwin explores the question of human identity, the nature of reality and, concomitantly, purity, that is, whether to sell out or not. All mixed together it makes for a crazy flower arrangement of fact, fiction and extreme fantasy that outdoes the duo's previous outing with Being John Malkovich. 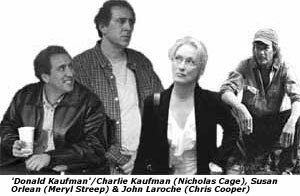 Fat, balding and neurotic screenwriter Charlie Kaufman (Nicholas Cage), consummate self-obsessed head-tripper consumed with inner considering, is to write a film adaptation of The New Yorker writer Susan Orlean's (Meryl Streep) best-selling book The Orchid Thief, an account of 36-year-old botanist and autodidact John Laroche's (Chris Connor) arrest for poaching "ghost orchids" from the Fakahatchee Strand, a state-owned nature preserve deep in the heart of the Florida Everglades. Kaufman's problem is that the book doesn't have much of a story. There's the trial, but Orlean's first-person book gives it short shrift. Instead, it's simply a peg around which she centers her own quest for passion, the meaning of meaning, the history of Florida land speculation and the obsessive nature of orchid collecting"orchidelirium." So what's a screenwriter to do? Kaufman, given his screenplays for Being John Malkovich, The Confessions of a Dangerous Mind and Human Nature, has a penchant for probing the plumbing of the mind. The artist in him wants to stay faithful to the book. That is, write a non-Hollywood script, one that reflects most people's experience of life, that is, no big changes, no epiphanies, no guns, violence. Pretty boring. Except for those who liked Andy Warhol's films, not a crowd pleaser. No wonder then that Charlie, a contemporary model of Thoreau's idea that "most people live lives of quiet desperation," drives himself nuts trying to bring real life to the screen. Up to this point in the film it's all fact. There is a Charlie Kaufman who is a screenwriter and who has been assigned to write a screenplay of Susan Orlean's book about orchids and a renegade South Florida botanist. But now enter Donald (also played by Nicolas Cage), Charlie's brother. Two strange peas from the same pod. Where Charlie is obsessed with ideas, Donald has no ideas. Where Charlie is hyper about people, Donald is oblivious, accepting others only as appendages of his own ego-world. Where Charlie agonizes over artistic purity, Donald's eye is riveted to becoming a big success. Where Charlie, after 13 weeks of sweating still doesn't have a screenplay that jells, brother Donald, fresh from a screenwriting course taught by a screenwriting guru, has written The 3, a conventional action thriller about a serial killer with a multiple personality disorder. And worse, brother Donald has sold his screenplay for six figures. Charlie's sweaty head and Donald's greasy palms are contrasted with flashbacks to Susan Orlean's research visits to the Florida swamps to sound out her book's protagonist, the raving, megalomaniac collector John Laroche who trades one obsessive passion for anotherfirst fossils, then tropical fish, then turtles, now orchids. In the book, Orlean asks a park ranger why so many people find orchids seductive. "Oh, mystery, beauty, unknowability, I suppose," he says. "Besides, I think the real reason is that life has no meaning. I mean, no obvious meaning. You wake up, you go to work, you do stuff. I think everybody's always looking for something a little unusual that can preoccupy them and help pass the time." Too bad Charlie couldn't have worked that into the script.